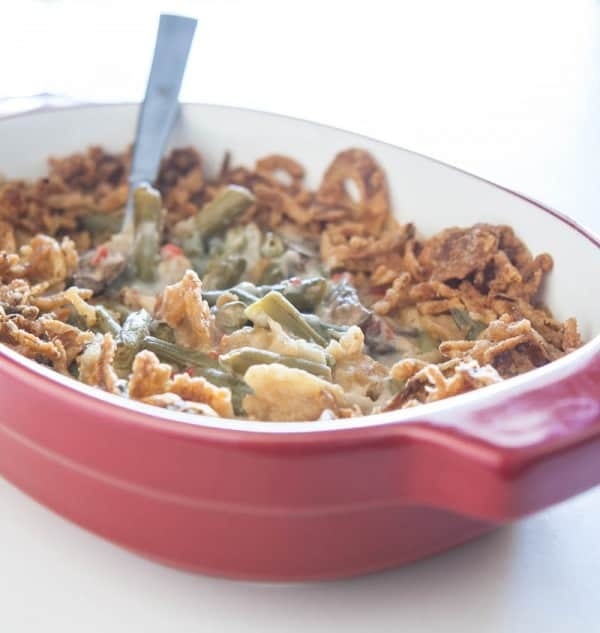 A few years ago, I decided to leave the green bean green casserole out of our Thanksgiving feast. Instead I made a simple side dish of just green beans. Boy was that a big mistake. If there’s one thing I didn’t know about my family, it’s that their love for the great green bean casserole is stronger than I ever imagined. 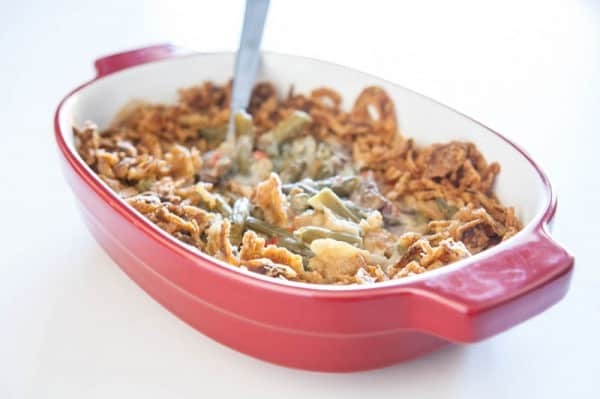 So every year now, without fail, I make sure the green bean casserole makes it to the table. I still like to keep the recipes as simple as possible though, but I do leave out the condensed soup. Instead, I make a simple, quick, and easy roux and then add it to the casserole as the delicious saucy base. For this casserole, after making the roux, I simply add salt, pepper, and worcestershire sauce. Then I add a couple of cans of drained Del Monte whole green beans, some canned mushrooms and a jar of pimentos. I love the pretty red pimentos, they make everything look so festive for the holidays! Then you can’t forget to add those wonderfully crunchy crispy onions on top. My family can’t get enough of these. Then I just pop my casserole in the oven and bake it until it’s crisp and delicious. It’s so easy! Preheat oven to 350 degrees. Melt 2 tablespoons butter in a large skillet over medium heat. Whisk in flour until smooth, and cook for a few minutes, or until mixture smells nutty. Whisk in the milk, salt, pepper, and worcestershire sauce. Bring to a boil while whisking and reduce to a simmer. Simmer until thickened. 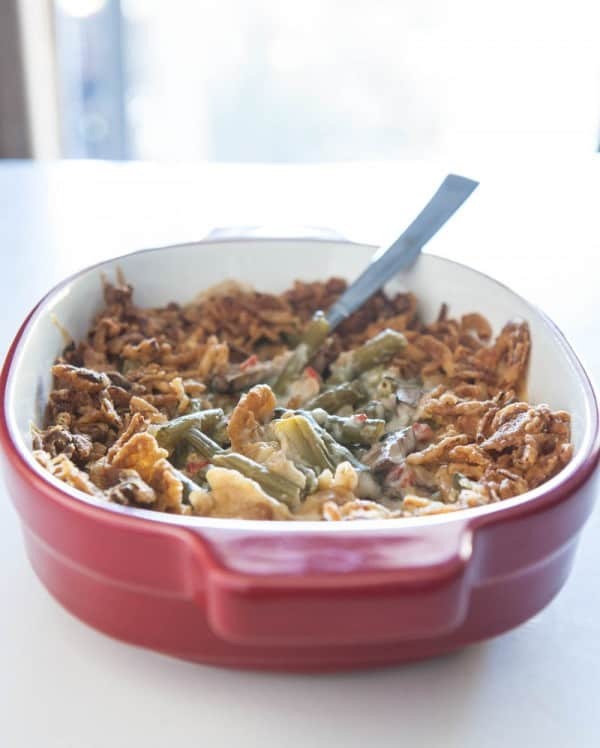 Add green beans, mushrooms and pimentos and half of the French fried onions. Mix well. Transfer the mixture to a 2 1/2 quart casserole dish. Spread the raining French fried onions over the top. Bake for 30 minutes in the preheated oven, or until the top is golden. Disclosure: This post was sponsored by Del Monte through their partnership with POPSUGAR Select. While I was compensated to write a post about Del Monte, all opinions are my own. This looks so yummy – can’t wait to make the recipe on Thanksgiving!